This post will cover the Yule ritual and celebration held by Circle of Fountains. 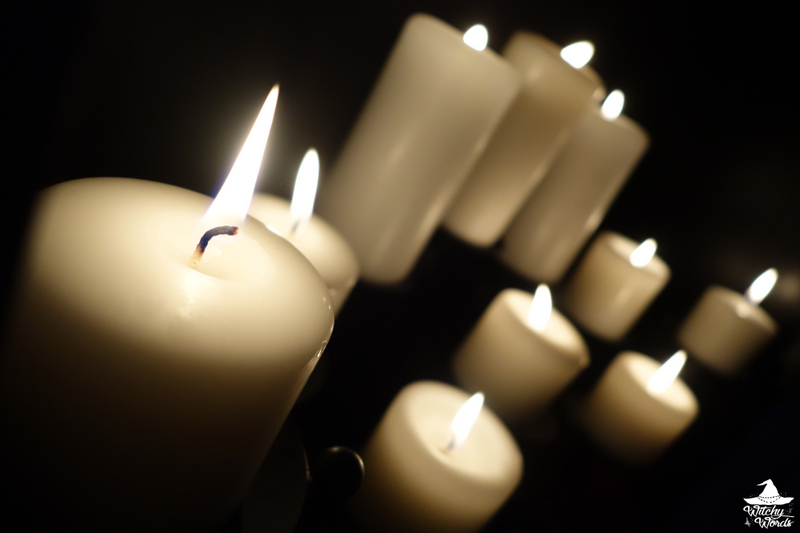 For the Circle of Fountains 2014 Yule ritual, click here! For all Yule related posts, click here! Our celebration was incredibly delayed by an ice storm that made travel treacherous the weekend of the 18th. Because the following weekend was Christmas with our individual families, the soonest we could hold our event was this past Sunday - yes, New Year's Day. Unfortunately, the public ritual was also on the same day as our original schedule for this ritual. I couldn't even get out of my driveway because of the ice, so there was no way I could attend that ritual either. That's why there's a certain lack of 2016 Yule posts this year! This year's winter solstice ritual was led by Laura! Each sabbat, a different Circle of Fountains member writes and leads the ritual. Because every member has a different belief system, we see a great variety of rituals throughout the year! 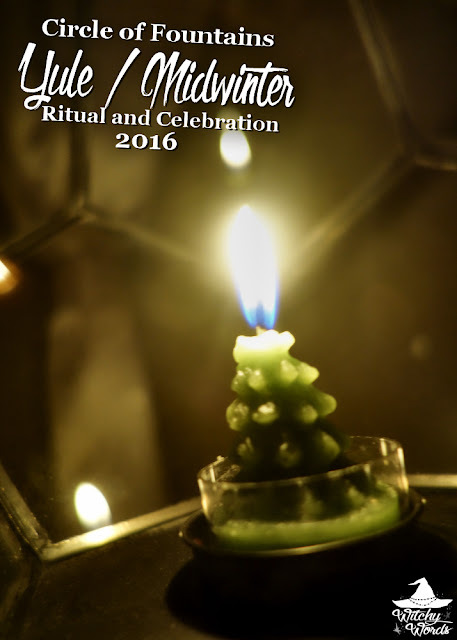 Laura identifies as a Northern Tradition pagan, and so her ritual walked us through a historical take on Jul combined with traditions we've established as a circle. The night began, as usual, with a craft! Because we were so delayed on the ritual, Laura wanted us to craft something that might draw our outfits together to represent the sabbat. These gorgeous black and white floral clips! This solstice focuses on the longest night and the coming of the sun. The black represents the longest night and the white, of course, represents the lengthening days from here on! Unfortunately, at this point, Kira had to leave due to an emergency. We send lots of love her way. We then had our potluck feast. Because the event was belated, I'm not entirely sure what everyone brought. My husband and I made a pot roast with brown gravy, carrots, onions, celery and potatoes. We also provided a lemon-pepper chicken as an alternative. I know Laura brought onion bread, Phaedra brought cheesy potatoes and Tamilia made red velvet cookies, but I honestly can't remember who brought what from there. My apologies! What I do know is that everything everyone made was absolutely delicious! A lit tree and these amazing floating candles that Laura created! Be on the lookout for them in other photos. They were incredible! We also lit as many candles in the room as we could to give the ritual a dim glow. Ritual began by the calling of the quarters, starting with east/air. These quarters had these adorable pine tree candles I found at Kohl's on sale after Christmas. Four to a box, perfect for our ritual. What a lucky find! Laura then continued our tradition of creating Yule Ornaments! This is something we do every year. 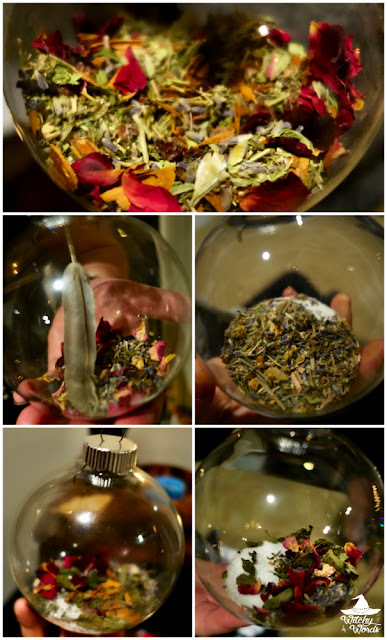 This year, however, Laura altered the theme a bit: She wanted us to create an orb that honored and called upon a deity, spirit, ancestor or friend. Laura's honored the goddess Persephone as they made a special connection during last year's Gaia Goddess Gathering. While I have a growing selection of spirits I could call upon, I almost always default to my familiar Nyx. I started with a mixture of salt and glitter for the base, representing the snowfall of the season. I then added rosemary, which is used for remembrance of those who have passed. I also added thyme for warding off the grief I often feel when she's present because she's no longer in physical form as well as to represent the loyalty she shows me. Rose petals add in the love we share, with the color red representing her fire and passion. I also added the tooth of a squirrel to connect the orb with the world of the dead. On top of this, I sprinkled ashes from a letter I wrote her and burned right after she passed as well as a few pieces of bread. 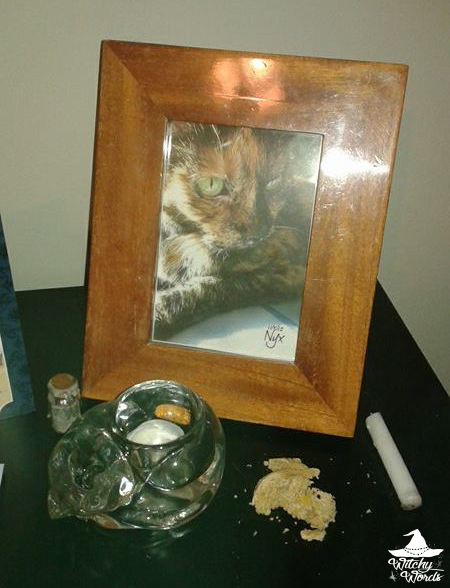 This was important because, right before the ritual, I also added a few pieces of bread as an offering to her temporary altar and lit the candle as well. So I had already beckoned her to join us. I then created this orb in her honor and added the bread to draw her to the ritual. Here you can see the many gods and goddesses represented by our circle, ranging from Hekate to Aphrodite to the moon as a deity herself. She then asked us to step up one by one, explain our ornaments and decorate the tree. The tree slowly became an altar to the deities and spirits we called upon! We then returned to the center altar as Laura started a song. She explained that a tradition associated with Yule was the sun wheel, a large, fiery wheel they would roll to welcome the sun. Because that's a bit of a fire hazard, she created a wreath out of garland, holly, pine cones and stones. She asked each of us to step forward, explain what teh sun represented to us and then light a candle. Once the altar was lit, it was truly a beautiful sight! We then "sacrificed" a pig. And by pig, I mean this adorable peppermint pig! The pig came with its very own pouch and tiny little hammer. Each of us took turns hitting the pig with the hammer. Laura then gave us little gift bags and let us take a few pieces of the peppermint pig with us to add to our altars! The final step of the ritual was the Yule Log, which I stepped in to explain. Our Yule Log tradition varies a bit from the Northern Tradition. In Laura's tradition, you typically take a piece of the bark with you. However, for the past several years, Circle of Fountains has been keeping a jar of ashes from previous logs. I explained that this year would be no different. However, instead of writing on the log, we were going to do something a little easier: Write on pieces of paper and nail it to the log! And so we did. Laura asked that we write on those slips of paper what gets us through our darkest moments. Answers ranged from their courage and heart to their family and, of course, this circle. With that, we closed the circle and wrapped up our celebration! A special congratulations to Laura on her first ritual ever with Circle of Fountains! From my circle to yours, we hope you had a blessed winter solstice! To see the previous Circle of Fountains sabbat ritual, Samhain, click here!